“The Flame Tree” is available online and at area bookstores. Born in Indonesia to American missionary parents, Richard Lewis developed two loves early on. The self-proclaimed “water rat” surfed and spent as much time as possible exploring for new surf spots in the 13,000-island archipelago. His other love, however – reading stories that explore other cultures – would prove not quite as plentiful. Growing up in Bali in the ’60s and ’70s, books were hard to come by and there was no television or book stores. Lewis’ only reading material consisted of what tourists brought for vacation and left behind. Yet it fueled his young imagination, and as a first-grader he penned his first adventure story about a yawn that traveled around the world. After graduating from college in the United States, he returned to Indonesia to write a story as universal in its message as the cultures in which he had lived. In his compelling debut novel about a young Christian boy and his parents in Islamic Indonesia before and after 9/11, “The Flame Tree ” is a poignant narrative about what it means to maintain faith, friendship and tolerance in an increasingly hostile world. With expansive and uninhibited prose, Lewis tells the story of 12-year-old Isaac Williams, the blond, blue-eyed son of American missionary doctors who gets caught up in an international crisis. Despite their background and dissimilar religious beliefs, protagonist Isaac is certain his friendship with Ismail Sutanto is as solid and enduring as the majestic flame tree in the yard. But as violence escalates following the events of 9/11, the peaceful coexistence between Muslims and Christians – as well as Isaac’s friendship with Ismail – is shattered when Americans are forced to evacuate and Isaac is taken hostage by an extremist Muslim group. The experience embitters young Isaac, who knows he should forgive those who hurt him but feels his bitterness will cripple him forever. At New York’s Trident Media Group, literary agent Scott Miller found the story, written for ages 12 and up, not just a powerful read but a valuable learning tool for both teens and adults. Lewis says the seed for “The Flame Tree” took root pre-9/11 in 1998 when Indonesia went through a severe economic and political upheaval. Lewis cut short a surf trip, and while waiting for a flight back home to Bali he imagined a young American boy caught up in the riots. He wrote much of the novel by hand while looking for surf, the salt water splotching the notebook. 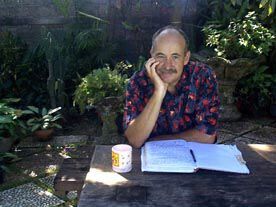 Lewis left for a surf trip in September 2001 with his book nearly complete. He wouldn’t see the news about 9/11 until two days after it happened. Given his novel’s theme and the inexplicable events of 9/11, he felt it an essential fit to the story and revised the novel to include the tragedy. 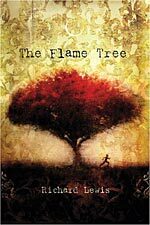 By turns shocking, revealing and ultimately uplifting, “The Flame Tree” is a coming-of-age tale about upholding one’s own beliefs while learning to embrace the ideas of others. Visit Richard’s website at www.richardlewisauthor.com.